A northerly wind comes from the north. A northerly current goes towards the north. Currents can help or hinder a kayak journey, and in some cases create rough sea conditions. Currents may be created by the rise and fall of the tides, in which case they are called tidal streams, or created by wind and convection currents. Most of the world's coastline, including most of the USA, has a small to moderate tidal range and is more affected by currents not caused by the tides. Click here for a diagram of global currents affecting North America. Along a coast with a big tidal range as in Maine, British Columbia and north-west Europe the main currents are tidal streams. Tidal streams seldom flow at more than 2 knots. A knot is one nautical mile per hour so 2 knots is 2.3 mph. For comparison, a mature river typically flows at 3 knots and a steep whitewater river at 6.5 knots. Tidal streams can flow at 3 knots or more at exposed headlands, or where the sea pours through a narrow channel or out of a shallow estuary. If the shape of the sea bed is just right, a 3 knot tide is capable of creating an area of large, toppling waves. See Overfalls & Tide Races. However such hazards are rare. Tidal streams are generally something for a sea kayaker to be aware of, not to fear. Strong currents make life more interesting, and with a little planning you can get a free ride to your destination. In an area of semi-diurnal tides like the north Atlantic, you might expect a coastal current to flow in one direction for six hours until high tide, then stop and flow the other way for six hours until low tide, with a pause of 15 minutes or so ("slack water") before it changes direction. 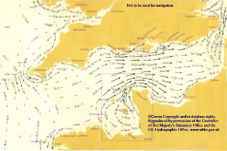 Coastal currents do very often flow in alternating directions and they do very often change direction at about the same time as local high tide or low tide. Surface flow and deep water flow do not necessarily change direction at the same time. In a channel, surface flow at the edge tends to change direction at a different time to that in the middle. Take the straits of Dover, which are the narrowest part of the shallow channel between Britain and France. Tidal streams at Dover don't start to flow out towards the Atlantic until five hours after local high water, and they start to come in towards the North Sea one hour before local high water. In an area of mixed tides such as Seattle, two consecutive high tides or low tides may be of very different heights and the effect on tidal streams is what you would expect. A powerful flood tide in the morning may be followed by a weak ebb, then a weak flood, then a powerful ebb in the evening. You can safely cross areas of extreme tidal streams by going at slack water, or at the time of the month when the tidal range is small. See Spring / Neap Tides. During neap tides, tidal streams usually flow about half as fast as during spring tides. That reduction in speed very often means that intimidating tide rips and dangerous overfalls become no more than uneasy swirls on the surface. "The sailorman cares nothing for their theories but goes by real knowledge and I by my sworn authority, the Admiralty texts, the like of which for excellence the world has not. 'High water, full and change, six hours 13 minutes after Dover. The stream is barely perceptible in the first three hours of the flood but runs very strongly in the third, and through three-quarters of the fourth hour, after which it slackens. There is no perceptible stream in the last two hours of the flood'. Or again 'On rounding Devil's Point the tide is lost'. There is no theorizing, no mumbo-jumbo. The thing itself, reality, is stated... the Channel Pilot tells you the truth. You stick blindly to its text and you are saved". Tide tables tell you the time of high and low tide, and the tidal range. You also need to know the timing, speed and direction of tidal streams, and you can find this data in twol places - in tidal diamonds on charts, and in a current atlas. On most maritime charts you will find at least a couple of "tidal diamonds". These are small magenta diamonds printed on the chart, each containing a letter or number which refers to a table of data in the margin. The table gives the direction of flow as a compass bearing for each hour before and after high tide. US charts on larger scales seldom have tidal diamonds but the same data can be found on the NOAA's Tidal Current Predictions pages. When the rate of flow slows down and the bearing changes dramatically, it must be slack water. Numerical data in tables is not exactly convenient. The best way to understand the strength and direction of a tidal stream is graphically, with with a current atlas. See below. Ready reckoners for tidal stream flow. Under the Rule of Twelfths, as long as you know the time and height of high tide you can predict roughly how high the tide will be at any time during the day. If you don't have a current atlas, various rules let you do the same for the speed of alternating tidal streams as long a you know the time of local slack water (which is not necessarily the same as local high tide or low tide). Each of the following is popular with some seafarers in areas of alternating tidal streams with semi-diurnal tides. They're all approximate and they each give different results. At slack water, there may be a few confused currents but the overall mass of water is stationary. The Rule of Thirds describes the flow at this time as 0/3. An hour later the rate of flow is 1/3 of the maximum printed on the chart. At two hours it is 2/3, at three it is 3/3, at four it is 2/3, at five it is 1/3 again, and after six it is slack water, so 0/3. Alternatively there is the 50/90 Rule which is often more accurate but perhaps not quite so easy to use in high wind and waves. It states that an hour after slack water the rate of flow is 50% of the maximum, at two hours it is 90%, at three hours 100%, at four hours 90% again, at 5 hours 50% and at six hours 0%. Or there's the Règle des Sixièmes (slack water - zero flow. First hour after, 3/6 flow. In the second hour after, 5/6 flow, in the third hour, 6/6 flow, then 5/6, then 3/6). Popular in France. Current atlas. Shows the direction of tidal streams at different times of day and uses thick and thin arrows to represent their speed. Has a page for each hour before and after high water. Various organizations publish current atlases. This thumbnail links to a sample page from an Admiralty "tidal stream atlas" of the entire English Channel, an area 400 miles across with some of the strongest tidal streams in the world. Click here for the main image. Atlases on a larger scale are available for the areas within magenta boxes. That's the Thames estuary, straits of Dover, Isle of Wight, Weymouth, and the Baie de St Malo. Later on this page you will find pages from an atlas on a very large scale showing the port of Dover. To make high tide in the North Sea, a lot of water has to flow east from the Atlantic. Half pours round the top of Scotland and half flows up the English Channel.The English Channel is shaped like a long funnel, more than 100 miles wide at the Atlantic end, but only 22 miles wide at the eastern end which is known as the Dover straits. The sample page shows tidal flows 4 hours before high water in Dover. As the flood tide enters the wide end of the funnel it starts by creating quite a gentle current, seldom reaching 2 knots. As the funnel gets narrower, every major headland that sticks out into the current causes it to speed up locally even in deep water. Where the water is relatively shallow, the tidal stream speeds up beyond 3 knots and becomes turbulent. Hence the tide races at Lands End, Dodman Point near Falmouth, Start Point (photo on next page) and Portland Bill. There are fast currents off St Catherine's Point on the Isle of Wight, but for really fast currents you have to cross the Channel. This graphic shows some of the same information as a current atlas. The headlands that stick out furthest into the current are on the French side, and the most prominent is the Cap de la Hague on the end of the Cotentin peninsula. Just offshore, tidal streams flow at up to 12 knots in the Race of Alderney (Raz Blanchard). The Channel Islands are just to the south-west. A little further south and west are the two main headlands at the tip of Brittany, where strong tidal streams often create hazardous sea conditions in the Raz de Sein, which is between the Pointe du Raz and the Isle de Sein, and near the Ile d'Ouessant which was known to British sailors as Ushant. There is some very good kayaking in both places, but you need to get the tides right. We might expect tidal streams in the straits of Dover to be particularly fast because this is the narrow end of the funnel where the flood tide has to squeeze through a gap, and the vertical tidal range at Dover during spring tides can be more than 15 feet. The current does indeed often run at 2 or 3 knots, and kayaking against that is slow and difficult. When a moderate wind blows in the opposite direction to a strong current it creates steep, choppy waves. These ''wind over tide" conditions may be too much for beginner or intermediate kayakers, but can avoided by staying in more sheltered waters. However by the time the flood tide reaches the straits of Dover it is near its destination and has started to lose its force. 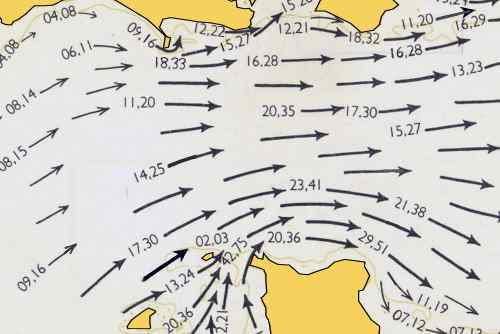 There are no extreme currents, overfalls or other tidal hazards in the straits. The current atlas for any particular area has only 13 pages and is a good buy. It is worth having a small-scale one covering your part of the world, for example the whole of western Scotland. For an area with strong or complex tides, it is worth getting a current atlas on a larger scale. For example, covering just south Devon. A few large-scale atlases are published by the official chart-makers. For areas where these are not available, often one has been produced by local enthusiasts. They tend not to stay in print forever, but you can often buy a secondhand copy through the internet or find one online courtesy of local kayakers or sailors. If you want to cross from one island to another and there is a strong tidal stream flowing through the channel between them, you are in exactly the same position as if you want to kayak across a river. If you try simply kayaking across it at 90 degrees you will immediately start to sag off course down-tide. By the time you reach the other side you will be considerably down-tide from your target and you will then have to go directly upstream to reach it. There is a more stylish technique - see Ferry Glides. A beginner kayaker may not realize that it is possible to get run over if you try to cross just up-tide of an anchored ship. If a ship is moored or anchored in water with a 3 knot current, for a kayaker it is exactly if the ship is travelling at 3 knots. An adverse current is seldom strong enough to be more than a nuisance, slowing you down if you are going the other way. It's often possible to time a trip so that the current is with you both ways, for example by launching at the top of an estuary two hours before low water, going down with the tide and returning with the flood two hours after low water. That particular trip won't be realistic if low tide is at 7 am, or the top of the estuary dries out except two hours each side of high water. Most daytrips mean going against the tide at some point. You may encounter a strong adverse current at the very tip of a headland or in a narrow channel which drains a large area such as an estuary. To go against that, your kayak needs speed. A traditional Greenland kayak has it, an ordinary sit-on-top doesn't. If you have to go upstream, usually the answer is to stay as close to shore as possible. If you want to go up an estuary against the ebb tide you will probably find sea waves to help you enter the mouth. Each wave will push you on your way a little and you may be able to surf on some of them. A wind blowing upriver may send helpful waves right up the estuary, as well as pushing you directly (leeway). Of course you can have too much of a good thing. A strong wind blowing against a strong current will create steep breaking waves (wind against tide conditions) which may capsize an inexperienced kayaker. A current in the sea behaves very much like a river, so a back eddy or counter-current forms downstream of everything which obstructs the flow. On one side of an eddy the water constantly flows upstream. A kayaker who wants to get to the tip of a headland against the current will find that just downstream of it there is an eddy 5 yards in diameter, or 10 yards or 100 yards. The inshore side will be flowing in the direction (s)he wants to go. See Back Eddies. Large eddies sometimes form alarming swirls on the surface but are seldom a problem to an intermediate kayaker. See Large Back Eddies & Whirlpools. Earlier on this page we looked at an extract from the current atlas of the English Channel at 4 hours before local high water. Here are two large-scale pages showing the port of Dover at the same time and also 2 hours after high water. This is a very big harbor with room to develop eddy currents like a bay. 2 hours after high water the main current during spring tides is about 1 knot north-easterly. Where the current piles up against the western arm of the port, it flows along that wall at a good 2.5 knots and creates a noticeable eddyline across the western entrance. A kayaker wanting to go against the current along the western arm would soon realise that the only way to do it is to go 100 yards out to sea. However, the second image shows that everywhere else at that time a kayaker who stayed close inshore would find a useful countercurrent - a free ride against the main current. Sometimes even the largest scale of current atlas would not show any helpful counter-currents but that doesn't mean there aren't any. A kayaker can use eddies on a small scale as in the illustration at left. On the downstream side of every rock that breaks the surface of a river, you will find an eddy large enough for the front of your kayak to sit in while you have a rest and admire the view. Thank you to Alan Byde for permission to use this illustration from his classic book Living Canoeing (A&C Black, 1969). A whitewater kayaker can often go some distance upstream by sprinting from one eddy to another (eddyhopping). On the downstream side of every little roughness of the river bank you will find a micro-eddy which provides enough shelter for you to hold your kayak against the bank with gentle movements of your paddle while you get your breath back. It's the same where a current flows past a shoreline or along the foot of cliffs - there are small eddies all the way along. By staying as close as possible to the shore, you can use them to go against the main current. 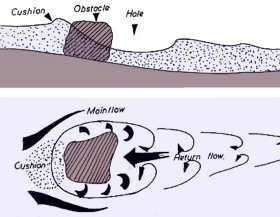 Back eddies or not, an adverse current is usually slower next to the shore because of friction and turbulent flow. You can also find shelter from an adverse current by staying inshore of a bed of kelp or a barrier reef. (b) wait until the tide turns and flows in the other direction, or at least slows down.